New Website DefLeppard.com Launching in May! Go to DefLeppard.com to hear the new single “Undefeated” and to view Mirror Ball’s cover art. Def Leppard has confirmed June 7, 2011 as the release date for their first ever live album Mirror Ball (Bludgeon Riffola/Mailboat Records), which will be available exclusively at Walmart & Sam’s Club locations in the United States and Canada. The album will include a 50 minute DVD that contains live performances and intimate backstage footage of the band captured on the road. A special limited vinyl edition will also be made available. Mirror Ball will also be available online, marking the first time the band’s music will officially be made available for digital purchase. Def Leppard will also be releasing their new community based website in May, which is being developed to be the ultimate Def Leppard fan experience and go- to destination for all things on the band. Said Joe Elliott, "To be able to say at last, we have a live album out & it be a three disc package which includes a DVD makes me very happy ... it's the soundtrack of OUR lives…!" Mirror Ball was recorded across the world over the course of many of the band’s sold-out dates and features all of the classic songs that have made Def Leppard one of the most respected and beloved power rock bands in the world. The album captures the group’s legendary concert experience at its thunderous best, bringing together live versions of classic Leppard hits such as “Pour Some Sugar on Me,” “Rock of Ages,” “Foolin',” “Hysteria,” “Photograph” and an incredible rendition of “Bringing on the Heartache.” With their creative juices at full flow, the band has also added three new studio tracks: “Undefeated,” “It’s All About Believin’” and “Kings of the World,” that are undeniably Def Leppard. Mirror Ball follows the band’s 2008 studio release, Live From the Sparkle Lounge, which debuted at #5 on the Billboard Top 200, marking the group’s highest chart position since 1992’s Adrenalized. 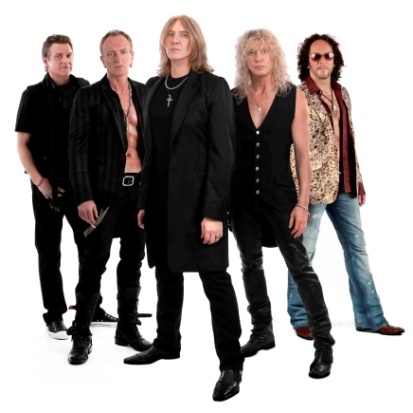 Last month, Def Leppard announced their triumphant return to US stages with a 48 city summer tour kicking off on June 15 in West Palm Beach, Florida. Tickets for the Live Nation produced tour and on sale now at Ticketmaster.com and LiveNation.com (for a list of dates go to DefLeppard.com). Joining Def Leppard for this highly anticipated tour are Seattle rock legends Heart. In addition to the album, Chronicle Books will be releasing Def Leppard: the Definitive Visual History, featuring photos of the band by legendary rock photographer Ross Halfin. His fully authorized visual history of the band follows them from their beginnings to their massive Pyromania and Hysteria albums to the sustained power of their records and tours today. The book will be available this June 15. With more than 65 million albums sold worldwide and two prestigious Diamond Awards to their credit, Def Leppard--Joe Elliott (vocals), Vivian Campbell (guitar), Phil Collen (guitar), Rick "Sav" Savage (bass) and Rick Allen (drums)—continues to be one of the most important forces in rock music. Over the course of their career, the band has produced a series of classic groundbreaking albums that set the sound for generations of music fans and artists. The group’s spectacular live shows, filled with powerful melodic rock anthems, have become synonymous with their name. For the past thirty years the band’s concerts have become must-see events and have quickly made them and institution in the touring industry, as they continue to sell out arenas worldwide. (New York, NY – May 24, 2011) The 2011 London Palladium cast recording of Andrew Lloyd Webber’s stunning new production of The Wizard Of Oz is currently available digitally and will be in stores June 28th through Decca Broadway in America. This 24 track set includes all the much-loved songs from the Oscar-winning movie score by Harold Arlen and E.Y. Harburg, plus new songs by Andrew Lloyd Webber and Tim Rice. The production features multiple award-winning performer Michael Crawford as the Wizard and Danielle Hope – winner of the 2010 British television talent competition Over the Rainbow – as Dorothy. Other performers in the cast include Edward Baker-Duly (Tin Man), David Ganly (Cowardly Lion), Paul Keating (Scarecrow), Emily Tierney (Glinda) and Hannah Waddingham (Wicked Witch Of The West). The Wizard of Oz is Tim Rice and Andrew Lloyd Webber's first production together in the West End in over three decades. To create the new musical, Lloyd Webber adapted the 1939 film's screenplay with director Jeremy Sams, and added several new songs to the film's score with Rice. In July 2010, Lloyd Webber told the Daily Mail, "The fact is that The Wizard of Oz has never really worked in the theatre. The film has one or two holes where in the theatre you need a song. For example, there's nothing for either of the two witches to sing. Tim and I are doing quite a specific thing, because we know what's missing." The production opened in England to excellent reviews and record-breaking business, and promises to inspire a new generation of fans by offering a new perspective on a timeless classic. Revered psychobilly trio Nekromantix have emerged from the depths of isolation to unleash their latest sonic creation, a monstrous slab of demonic rock and roll entitled What Happens In Hell, Stays In Hell. This dangerously hypnotic album careens into stores on August 2, 2011 via Hellcat Records and includes 13 songs of blistering death defying rock. In anticipation, the band will be offering special VIP Packages to their most dedicated fans on May 26 through the website below. In support of the new album, Nekromantix will be loading up their hot-rod hearse to blaze across North America, igniting the festivities with a performance in the scorched desert landscape of Southern California on July 26th. This review was originally posted on The Orange County Register Web site earlier today. A special "thank you" to Omega Events for the access to shoot photos throughout the event. There was truly something for everybody during Day 2 of the 14th annual Doheny Blues Festival in Dana Point, which played out on May 22. 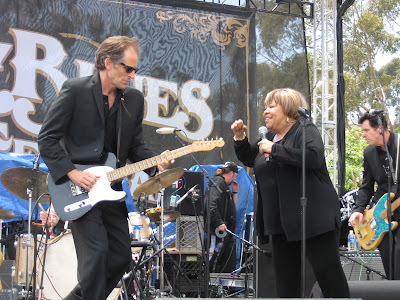 For those who skipped church Sunday morning, legendary singer Mavis Staples (pictured above with her band guitarist Rick Holmstrom) delivered an inspired set steeped in gospel and old-school rhythm ‘n’ blues. For those looking for traditional roots, an acoustic set from B.B. & the Blues Shacks and a 90-minute celebration of pioneer Robert Johnson fit the bill. And for those seeking jaw-dropping guitar work, singer and six-string virtuoso Walter Trout produced that and more. Americana fans even got a sonic dish, thanks to a super-sized set from the original lineup of rockabilly revivalists the Blasters. But more on all that in a bit, for the crowning set of the day was the much-anticipated return of John Fogerty. Those who caught his unforgettable set here in May 2007, his only other appearance at Doheny, need not have feared that lightning wouldn’t strike twice: this headlining return Sunday evening conjured up the same magic of that night four years ago, then proved that his current show is even stronger. 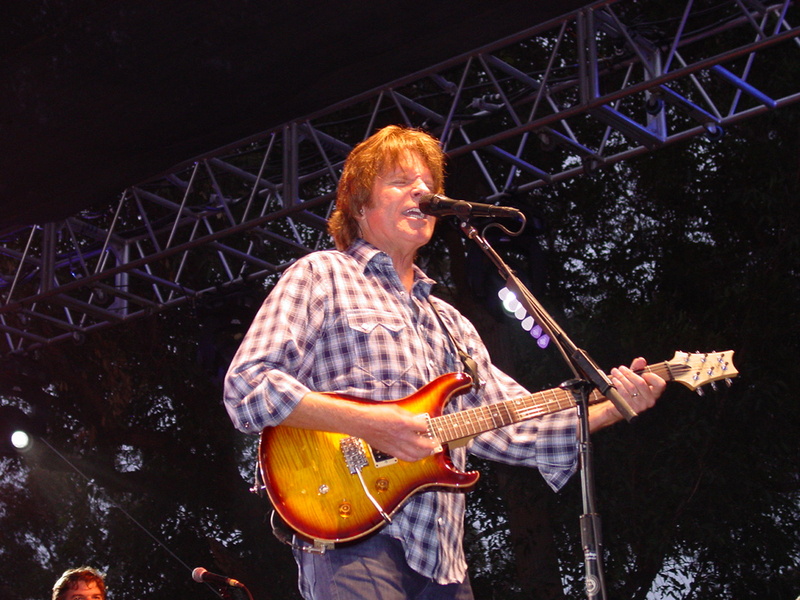 Now nearly 65, Fogerty shows no signs of slowing down. He ran around the stage like a young man a third his age, tearing up on one guitar solo after another; his voice, too, remains more intact than any other rocker’s from his era. To boot, his genuine personality brightens his performances in a way that defies detached rock-star cool that I think hurts many Hall of Famers in their twilight years. And talk about a set list! From the opening “Hey Tonight” to a rousing one-two punch of an encore with “Bad Moon Rising” and “Proud Mary,” Fogerty hit all the high points. With the exception of “Sweet Hitch-Hiker” and his jammed-out version of “I Heard It Through the Grapevine,” he and his band played all of this writer’s favorites Sunday night. Lovers of Americana-flavored nuggets heard wonderful versions of “Lodi,” “Green River” and “Born on the Bayou.” His emotive voice brought real depth to timeless acoustic-guitar-anchored classics like “Have You Ever Seen the Rain?,” “Long as I Can See the Light” and “Who’ll Stop the Rain,” and he flat-out rocked the beach with “Fortunate Son” and “Keep On Chooglin’.” I could rave plenty more about this brilliant festival-ending set, but the key thing is to encourage every rock fan who hasn’t yet seen Fogerty live lately to do so as soon as possible. The day’s other highly-anticipated performance also didn’t disappoint: the original lineup of Downey purists the Blasters performed with all the power of their early ’80s shows. For one day, brothers Dave (on guitar) and Phil Alvin (rhythm guitar, lead vocals), plus keyboardist-singer Gene Taylor (who flew in from England for this fest) and the band’s rhythm section of John Bazz (bass) and Bill Bateman (drums) got together and demonstrated what always made them such a great band. “Dark Night,” “I’m Shakin’” and “Marie Marie” were among the highlights of the quintet’s 80-minute set, with the crowd pushing against the stage hoping the reunion might never end. Huntington Beach hero Trout, meanwhile, continues to garner new fans as the style of guitar playing he has championed since the early ’70s continues its ever-burgeoning popularity; indeed, Joe Bonamassa‘s approach owes a debt to Trout’s template. On Sunday afternoon, he demonstrated that his original heavy-hitting blues-rock, packed with lyrical insight, affecting vocals and extraordinary fretwork, has widespread appeal in 2011. From his chronicle of Surf City (“Life in the Jungle”) to his beautifully sung plea for the world to find some “Common Ground,” Trout’s set was an artistic home run. Staples, 71, began her recording career back at the dawn of the ’50s as a member of Chicago’s venerable Staple Singers. More than six decades later, she still has the ability to thrill an audience with her powerful, soulful vocals. At Doheny, she was backed by three singers and a sparse three-man band that really brought her gospel blues to life. Her set-opening “Wonderful Savior” and rousing “Creep Along Moses” (both from her Jeff Tweedy-enhanced, Grammy-winning 2010 album You Are Not Alone) celebrated her faith in a joyous spirit, while a version of the Band‘s classic “The Weight” (which she helped sing for a studio side of that group’s The Last Waltz) brought additional intensity to her set. Early in the day, I got to check out singer-guitarist Ana Popovic for a few songs. She proved to be an enthusiastic and talented artist, with her skills playing lead, rhythm and slide guitar all put to good use. She is also a good singer, but it was her solid guitar work that thrilled the crowd. Throughout the day, a trio of acts performed laid-back but impressive sets on the Backporch Stage. I was able to squeeze in a few minutes for each, all of them attracting large crowds that cheered on the Americana/Latin/blues-rock of David Hidalgo and Cesar Rojas of Los Lobos (who also appeared Saturday as part of the Experience Hendrix tribute) as well as the aforementioned Burnside and B.B. & the Blues Shacks. This review (co-written by Ben Wener and me) was originally posted on Sunday morning, May 22, 2011. A special "thank you" to Omega Events for access to take these photos throughout the two-day festival. Until I’m back on site, mellowing on the grass as waves crash nearby, I tend to forget that there’s no weekend bash in O.C. (maybe L.A. too) that better embodies the spirit of Monterey Pop than the annual Doheny Blues Festival in Dana Point. Not only are the crowds laid-back, highly attentive and deeply into the sounds, but the performers — who this time range from gospel great Mavis Staples and New Orleans funk pioneers the Funky Meters to a fest-closing set Sunday evening from John Fogerty, with a dozen more in between — all evoke the soul-satisfying musical purity that rose out of the late ’60s. And no act did that more during Saturday’s half of the festival than the touring Experience Hendrix troupe, an all-star array of modern and legendary guitar greats in a nearly three-hour tribute to the most innovative virtuoso who ever touched six strings. It’s the first time the concept has come to Orange County, but I daresay there was a sparked-up feel to this outdoor set that earlier appearances indoors at Gibson Amphitheatre couldn’t possibly capture. At Doheny, it felt a bit like Clapton’s Crossroads Festival had been miniaturized and shipped west. 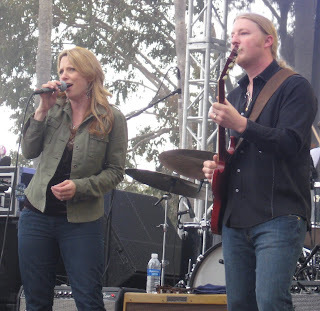 It helped, of course, that the performances were uniformly strong, though there were occasional glitches (Susan Tedeschi found herself unplugged when she went to solo during “Spanish Castle Magic”) plus a jam or two that eventually dawdled. “Them Changes,” for instance, with Corey Glover of Living Colour on vocals, sizzled at first but fizzled out two-thirds in as a host of players — Robert Randolph, Derek Trucks, Los Lobos‘ David Hidalgo and Cesar Rosas — never seemed sure who was taking the lead next. The bulk of the salute, however, was overwhelmingly strong, even inspired, an Electric Church encounter that one likes to think would have made Jimi proud. From there it was one standout moment after another. With guitarist Vernon Reid still in captivating form, Living Colour roared through “Power of Soul” and “Crosstown Traffic,” with Glover climbing up rigs and hopping over fences to get closer to the crowd. 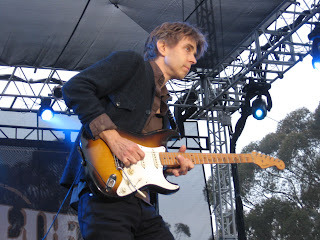 Eric Johnson (pictured at the top of this post) was less flashy though no less technically elegant on renditions of “Burning of the Midnight Lamp,” “Bold as Love” and “Are You Experienced?,” assisted by bassist Scott Nelson and Double Trouble drummer Chris Layton. Rosas and Hidalgo led robust readings of “Little Wing” (joined by Tedeschi) and “Hey Joe,” while Randolph was given the steep task of enlivening that most recognizable Jimi track, “Purple Haze.” The least compelling portion came from Jonny Lang and Aerosmith’s Brad Whitford — they had the skill for “The Wind Cries Mary” and “Fire,” just not well-rehearsed precision. While that parade of amazing heroes was the day’s surefire attraction, the 90-minute performance from the newly formed Tedeschi Trucks Band was the hidden weapon that will forever make Day 1 at this 14th Doheny Blues Festival so memorable. The 11-member ensemble, led by Susan Tedeschi and Derek Trucks, simply would have torn the roof off the joint if Doheny State Beach had one. A singer able to draw emotion out of each note, Tedeschi sang a mix of blues, gospel, Southern rock, soul and funk material with nonstop emotion. She hit high notes at full Joplinesque volume but proved her artistry is much deeper than that by employing dynamics, phrasing and awareness of what the rest of the band’s sonics to really make the group’s 10 songs come to life. With husband and slide-guitar virtuoso Trucks by her side, the two revealed a troupe that surely doesn’t sound like Springsteen and the E-Street Band (they’d never funk so hard on a cover of Sly Stone’s “Sing a Simple Song”) yet has that same ability to unleash fiery highs and tender lows. On the gospel blues of “Bound for Glory” (from the TTB’s forthcoming debut, Revelator), the group spotlighted a full horn section and solid backing vocals from harmony singers Mark Rivers and Mike Mattison. That’s about as much range as most bands of this ilk ever show — but those bands don’t have Derek Trucks, who delivered an exhilarating solo so perfect, it left the chatty party folks crowded around me nearly speechless. And that was only the second song in the set. Other highlights included “Midnight in Harlem,” with Trucks’ otherworldly guitar work serving as the perfect introduction to the heavy blues groove of “Learn How to Love” bolstered by another monster solo from Trucks. Elsewhere, on “Until You Remember,” the horn section showed off its muscle, but this new unification is proving to be an outfit for which no beat or note was wasted or unwarranted. While no other acts on the bill demonstrated such magic, blues lovers still got the kind of overall strong performances they’ve come to expect at this event. The 44′s kicked off the action on the Sailor Jerry Stage with a gritty set, and a guest shot from acclaimed Anaheim guitarist Kid Ramos helped kick it up a notch. 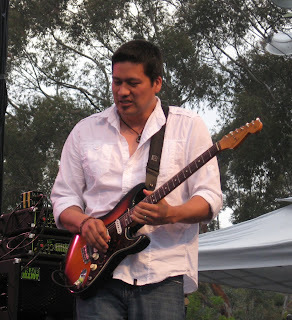 During a fast-paced 55-minute set, the group indulged an extended jam in which Ramos and singer-guitarist Johnny Main traded leads, while harmonica pro Tex Nakamura added fantastic solos. The band’s set ended with an uplifting version of “Going to the Church,” its propulsive drive getting fans moving in time to the music. Boasting a voice that recalls Janis Joplin but doesn’t merely mimic the legend, Eden Brent brought her forceful vocals and skilled piano playing to the Backporch Stage. I thought her version of the ballad “Beyond My Broken Dreams,” written in the wake of 9/11, was a highlight. When B.B. & the Blues Shacks first appeared at Doheny Blues a few years ago, thrilled fans couldn’t believe the group was from Germany. After catching its full set Saturday afternoon, I’ve come away equally surprised. Though based in Hildesheim, the quintet offered up Chicago-style blues as convincingly as any artist on the bill. They were among my favorite acts of the day, offering up traditional blues with an easygoing approach. This concert preview was originally posted on The Orange County Register Web site on May 18, 2011. I took the photo of rocker John Fogerty when he first performed at the Doheny Blues Festival in May 2007. Even longtime attendees of the annual Doheny Blues Festival in Dana Point should expect a few surprises from this year’s bash on the beach, scheduled for Saturday, May 21 (11 a.m.-9:30 p.m.) and Sunday, May 22 (11 a.m.-8:30 p.m.). This year’s high-powered lineup is arguably the most exciting in the 14-year history of the event, thanks in part to the first O.C. gathering of the sprawling Experience Hendrix show, a nearly three-hour salute to the legendary guitarist featuring original Band of Gypsys bassist Billy Cox and an array of six-string progeny: Steve Vai, Jonny Lang, Robert Randolph, Eric Johnson, Ernie Isley, Brad Whitford of Aerosmith, Cesar Rosas and David Hidalgo of Los Lobos, Living Colour, Mato Nanji of Indigenous and more. Other much-anticipated performers include the original Funky Meters, gospel great Mavis Staples, an homage to Robert Johnson featuring Big Head Todd & the Monsters, Charlie Musselwhite and Cedric Burnside, and the Southern California unveiling of the Tedeschi Trucks Band, the newly launched outfit featuring the husband-wife duo of singer-songwriter-guitarist Susan Tedeschi and slide guitar virtuoso Derek Trucks. That group will perform songs off its forthcoming debut Revelator during a 90-minute set Saturday on the main stage, just before Experience Hendrix. The rest of the 11-member outfit includes brothers bassist Oteil Burbridge and Kofi Burbridge (keyboards and flute, respectively), trumpeter Maurice Brown, tenor saxophonist Kebbi Williams, trombonist Saunders Sermons and harmony singers Mark Rivers and Mike Mattison. “We pretty much spent last year writing,” Tedeschi explained. “The two of us wrote with different songwriters who would come down to the house (in Jacksonville, Fla.). We started out with the idea that we would have Kofi definitely in the band. We really wanted Oteil, his younger brother, who plays with Derek in the Allman Brothers. Just as Mattison has found a new role in the project, so has Tedeschi; though a celebrated lead guitarist, it’s her gospel-drenched vocals that are her biggest contribution to Revelator. Trucks, meanwhile, a new master who can jam like few others, has sharpened his fretwork around songs that range from classic rock and ’70s funk to timeless blues delivered with a modern-day edge. Revelator doesn’t come out until June 7, but Tedeschi said Saturday’s Dana Point crowd will get to hear some tracks from it, likely “Bound for Glory,” “Midnight in Harlem” and “Learn How to Love,” the latter of which the TTB performed on The Tonight Show with Jay Leno earlier this week. Of the festival overall, Sherman said his team worked hard this year to put together something special. “To the best of our ability, we try to book artists who have never played at Doheny Blues, and mix them in with fan favorites and some cool packages. This year, I think we hit a home run in that department,” he believes, not only in acquiring the Hendrix and Johnson sets but also by satisfying O.C.’s undying love of rockabilly via the inclusion of the Blasters as well as Stray Cats bassist Lee Rocker. But the impetus behind the project was more than just revisiting songs he loved as a child. Over the years he has collected a wide range of folk-based instruments, and on the new EP he gets to showcase ukulele, banjos, autoharp and harmonicas amid these creative covers. The 14th annual Doheny Blues Festival at Doheny State Beach in Dana Point (25300 Dana Point Harbor Drive) runs Saturday from 11 a.m. to 9:30 p.m. and Sunday from 11 a.m. to 8:30 p.m.
Day 1′s lineup includes the Experience Hendrix tribute along with the Tedeschi Trucks Band, Lee Rocker, the Funky Meters and more. Day 2′s roster features John Fogerty, a Robert Johnson tribute led by Big Head Todd & the Monsters, the Blasters, Walter Trout, Mavis Staples and others. Tickets are $50 for single-day general admission, $80 for a two-day passes, $10 per day for children. All prices go up $10 on the day of the show. Call 949-360-7800 or visit the official website for more details. I've been so busy gearing up for my coverage of the 14th annual Doheny Blues Festival this weekend, I simply have not had much time to post some of the nuggets landing in my inbox. But before I am swept away by the music of John Fogerty, Lee Rocker, Walter Trout and the countless other greats coming to Dana Point this coming weekend, here are a few items of interest to music fans. Seattle, WA's Kay Kay and His Weathered Underground will release their sophomore album Introducing Kay Kay and His Weathered Underground on July 26th, 2011 via Suburban Home. Introducing Kay Kay and His Weathered Underground is an adventurous collection: 10 songs formed by a kaleidoscope of sounds and instrumentation. Telling tales of bohemian urban discontent, Introducing... reins in the grand, sprawling scope of their self-titled debut - which landed on Alternative Press' 'Top 10 Albums of 2008' list - and takes the band's unrelenting psych-pop melodies to soaring new heights and subtle nuance. Opener "Sweet Strange Dreams" sets the tone with its Beach Boys-dreamy, playful, languid atmosphere. "Diggin'" floats on an easy '70s groove and soaring carnival sounds, and it is quickly followed by the plucky swing of "Oh Lord, I Hate You California." Other highlights include the ragtime-infused, expansive and climactic "Paychecks and Pipe Dreams" and the lush, summery "World's Entire." 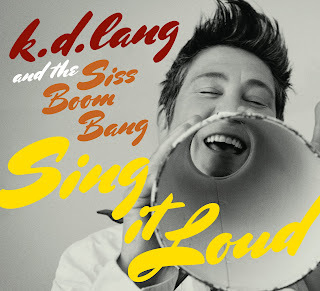 Sweeping strings and horns accent throughout Introducing..., while Kirk Huffman's versatile vocals range from hush, to croon, to a rich, clear tenor. At the heart of Kay Kay is songwriters Huffman and Kyle O'Quin, who began writing new songs together during the final touring days of their previous band, Gatsby's American Dream. Those songs became Kay Kay's first self-release, 2007's live album/live DVD Live From The Pretty Parlor as well as their first studio LP. Around this duo rotates a cast of accomplished local musicians, who perform both on record and live to add diverse instrumentation, including: cello, violin, tuba, trumpet, and flugelhorn, among others. Cellist Phil Peterson, who frequently performs with Nada Surf, also records Kay Kay's releases at his home studio, The House of Breaking Glass. Huffman and O'Quin began writing and recording Introducing... in late 2008/early 2009 but, near completion, set it aside for months to mourn the tragic loss of their mentor, renowned producer and engineer Tom Pfaeffle. John Goodmanson (Death Cab For Cutie, Sleater-Kinney, Blonde Redhead), and Steve Fisk (Soundgarden, Minus The Bear, Beat Happening) finished mixing the album early last year. Known for their boisterous live show that often includes up to 15 members on stage, Kay Kay has toured with Portugal. The Man, mewithoutyou, The Dear Hunter, and Damien Jurado, for whom they both opened and played as his backing band. The band has also performed on Last Call with Carson Daly, at the Bumbershoot and Sasquatch festivals, and headlined the 2008 Capitol Hill Block Party in their hometown. Kay Kay will hit the road again this summer for a US tour; dates will be announced shortly. k.d. lang launched her most recent release Sing it Loud, with new band the Siss Boom Bang, in a series of small venues -- but none more intimate than the show hosted by KCRW (89.9FM and KCRW.com) at Apogee’s Berkeley Street Studio. It is now available online for all to see here. The live session, as well as an interview conducted by KCRW DJ Anne Litt was also aired on Morning Becomes Eclectic at 11 a.m. PST on May 16.
k.d. is only the second artist to be featured in KCRW’s Berkeley Street Sessions in 2011. Last year, the station hosted Manu Chao, Interpol, Janelle Monae, Nas and Damien Marley, David Gray and Chrissie Hynde and the Fairground Boys, all with Bob Clearmountain at the boards. After k.d.’s performance, the legendary producer/mixer - who has worked with everyone from The Rolling Stones to Bruce Springsteen & the E-Street Band – exclaimed “nights like this are the reason I got into this business." k.d. also admitted that she discovered the bands she’s chosen as openers for her tour by listening to KCRW, including LA buzz band The Belle Brigade, The Secret Sisters, and Teddy Thompson. Check out the session in our archives and read a full transcript of the interview online here. ABOUT KCRWKCRW 89.9FM, licensed to Santa Monica College, is National Public Radio's flagship station for Southern California. The Los Angeles-based nonprofit represents cutting edge radio at its best, presenting an eclectic mix of independent music, news, talk and arts programming. The terrestrial signal serves Los Angeles, Orange, Ventura Counties, as well as parts of San Diego, San Bernardino, Kern, and Santa Barbara Counties and the greater Palm Springs area. KCRW’s programming is internationally renowned and available worldwide via KCRW.com, including three streaming channels, 27 podcasts and archives of our locally-produced programs and live band performances. Hear KCRW music online, all the time, on the ALL music stream Eclectic24. HDNet will air a special LIVE concert event featuring two time Rock n’ Roll Hall of Fame Inductees, David Crosby (The Byrds/ CSN) and Graham Nash (The Hollies/ CSN), from a stop on their current Crosby-Nash tour. “Crosby-Nash: In Concert” will air Sunday, May 22, 2011 at 7:30 p.m. ET with an encore presentation the same evening. Singer-songwriters David Crosby and Graham Nash have been harmonizing ever since Crosby, Stills & Nash formed in 1968. In addition to making music with CSN and CSN&Y, an ongoing element of their collaboration is recording and performing as a duo. That two-man configuration is celebrated in this concert event and with the launch of Crosby and Nash's new independent label - Blue Castle Records, distributed by ADA and ADA Global - with digital and vinyl versions of Another Stoney Evening which was re-issued March 22 of this year. Broadcast live from the Palace Theatre in Stamford, Connecticut, this legendary rock duo will perform many songs from their extensive catalogue, including “Long Time Gone,” “Marrakesh Express,” “Almost Cut My Hair,” and “Our House.” Their magical vocal harmonies will evoke the excitement of 40 years of rock history in this one-of-a-kind performance. Don't miss this landmark concert, only on HDNet! About HDNetHDNet (www.hd.net) is the independent network with unique and thought-provoking content that appeals to men of all ages and is delivered in true high definition. HDNet delivers the world's largest and most diverse concert line-up through the HDNet Concert Series. The HDNet Concert Series features leading artists and bands including Paul McCartney, Mariah Carey, John Mayer, Nickelback and more. PBS has announced that Cameron Crowe’s Pearl Jam Twenty, from the award-winning AMERICAN MASTERS series, will join the first-ever PBS Arts Fall Festival, a multi-platform event, featuring nine programs with a range of artists and performances from around the country, inviting every American into the world of music, theater, dance, art and cultural history. Carved from more than 1,200 hours of rarely and never-before-seen footage, plus 24 hours of recently shot interview and live footage, AMERICAN MASTERS Pearl Jam Twenty is the definitive portrait of Pearl Jam as told by award-winning director and music journalist Cameron Crowe. The film’s broadcast premiere is Friday, October 21, 2011, 9 p.m. ET/PT on PBS and coincides with Pearl Jam’s yearlong celebration of its 20th anniversary. PBS member station KCTS Seattle is creating a mini-documentary about today’s Seattle arts scene to coincide with the broadcast. “We are delighted to be presenting Pearl Jam’s 20th on AMERICAN MASTERS 25th — a truly perfect anniversary celebration! We continue the tradition of matching world-class filmmakers with subjects like this band, who revolutionized our culture with their music and their exemplary social consciousness,” says Susan Lacy, series creator and executive producer of AMERICAN MASTERS, a seven-time winner of the Emmy® Award for Outstanding Primetime Non-Fiction Series. The series is a production of THIRTEEN for WNET. More information will be available at www.pbs.org/americanmasters. 2011 is a yearlong celebration of Pearl Jam’s 20-year history. The band started off the year with the release of a new live compilation album, Live on Ten Legs, followed by the expanded reissues of Vs. and Vitalogy in March. Things kick into high gear in September with the Anniversary Weekend Concert on Labor Day weekend, followed by the release of Cameron Crowe’s film, Pearl Jam Twenty with accompanying book and soundtrack album. 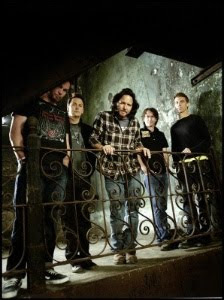 For the latest Pearl Jam happenings, including an upcoming tour of Canada, visit www.pearljam.com. As part of PBS’ commitment to increasing every American’s access and participation in the arts, PBS is kicking off a multi-platform event on October 14th, and every Friday night into December, featuring a range of artists and performances from nine different communities and celebrity hosts from each locale. Full-length performances, behind-the-scenes interviews, profiles of artists and performers, and mini-documentaries of women rock-and-rollers, banjo pickers, award-winning choreographers and local art scenes offer a front-row seat and backstage pass to entertain and inspire viewers. In addition, PBSArts.org will host weekly curated, immersive, themed exhibits that take consumers beyond the television experience and into the creative process itself, and PBS will create innovative classroom tools to help fill gaps in arts education. Funding for the launch of PBS Arts has been provided by Anne Ray Charitable Trust, public television viewers and PBS. AMERICAN MASTERS is made possible by the support of the National Endowment for the Arts and by the Corporation for Public Broadcasting. Additional funding for AMERICAN MASTERS is provided by Rosalind P. Walter, The Blanche & Irving Laurie Foundation, Rolf and Elizabeth Rosenthal, Cheryl and Philip Milstein Family, Jack Rudin, The André and Elizabeth Kertész Foundation, Michael & Helen Schaffer Foundation and public television viewers. No wonder I'm always an earful behind? The releases keep on coming and more are on the way. Here are some highlights of recent announcements to land in my inbox from Yeproc Records. 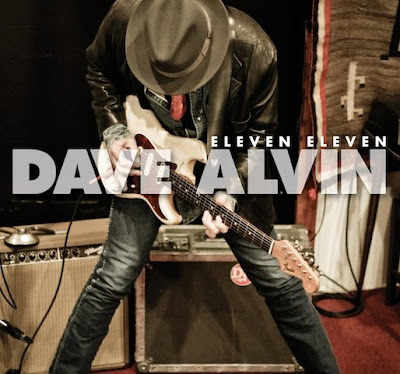 Dave Alvin will release his next studio album titled Eleven Eleven on June 21, 2011. Eleven Eleven, which includes 11 tracks and for the first time ever (listen up Blasters fans), finds Dave singing a duet with his brother Phil Alvin. Yep Roc Records is excited to announce the upcoming release of Dave Alvin's new studio album titled Eleven Eleven on June 21. Eleven Eleven, described as the "King of California's" most driving, electric blues and rock oriented album since 2004's critically acclaimed Ashgrove, includes 11-tracks, for the first time in his career, written and recorded on the road and during breaks while on tour. 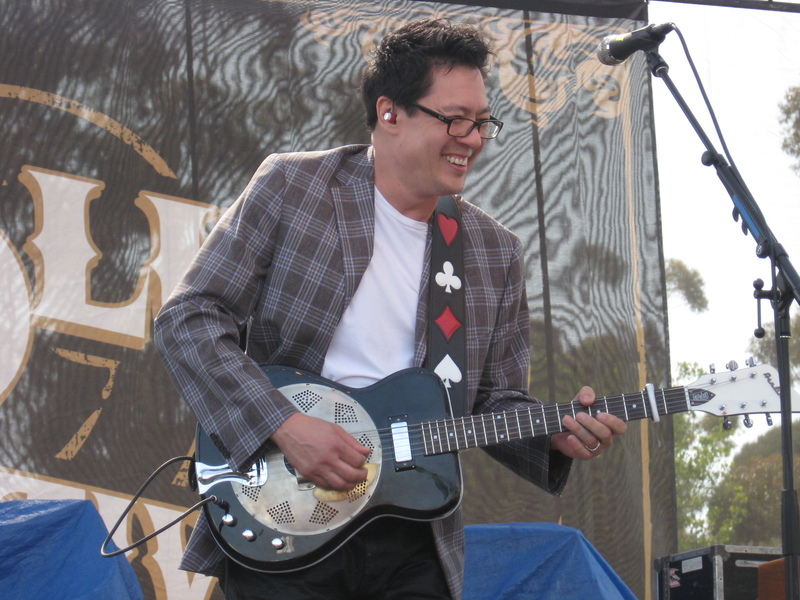 The album features a host musicians Alvin had not recorded with since his days in The Blasters, and for the first time ever, sings on record with his brother Phil, the lead singer of The Blasters. A full U.S. summer tour in support is to be announced. While the backing cast varies with different musicians at sessions separated by weeks of time, the one constant is Alvin's assured guitar-playing. Whether it's finger-picking on an acoustic against an accordion on "No Worries Mija" or blazing riffs on electric over a Bo Diddley beat on "Run Conejo Run," Eleven Eleven casts a consistent gritty, bluesy feel from start to finish. The result is an album with songs rich in vivid stories, taking listeners on a bounty hunt in "Murrietta's Head," a tawdry scene of seduction in "Dirty Nightgown" and a true crime recollection in "Johnny Ace is Dead." Dave's guitar work punctuates each tale, reinforcing moments of urgency, remorse and reflection. "The songs on Eleven Eleven are all about life, love, death, loss, money, justice, labor, faith, doubt, family and friendship. The usual stuff," said Alvin. "Mortality has been an issue on my mind ever since Ashgrove. Since finishing that album, I lost some great friends - Chris Gaffney, Amy Farris and Buddy Blue of the Beat Farmers. That weighed on me." The album reunites Dave with pianist Gene Taylor, whose barrelhouse blues sound has not been heard on an Alvin project since the final Blasters album, 1985's "Hard Line," and features three duets: brother Phil Alvin and Dave on the simmering blues "What's Up With Your Brother"; Dave and Christy McWilson from the Guilty Women on the gentle country number "Manzanita" and the whimsical song, "Two Lucky Bums," the final recording of Dave and his best friend, the late Chris Gaffney. The rest of the material, rich in stories that stretch from R&B royalty to labor history to Harlan County in Kentucky, was written over the course of seven months. Recently, Alvin released the first single from the new album set, "Harlan County Line." The song, now available on iTunes, was written and recorded specifically for the FX television series Justified, fictionally based in Harlan County, KY. Alvin and his band appeared in an episode earlier this season (episode 3 titled "The I of the Storm"), performing during a barroom scene. 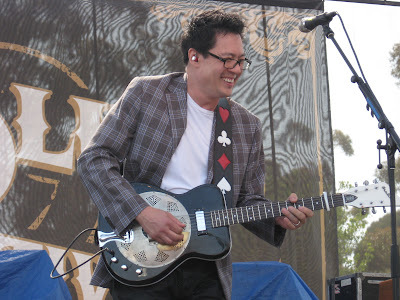 Combining elements of blues, folk, R+B, rockabilly, Bakersfield country and garage rock and roll with lyrical inspiration from local writers and poets like Raymond Chandler, Gerald Locklin and Charles Bukowski, Alvin has mixed his varied musical and literary influences into his own unique, updated version of traditional American music. "My songs are just like California," says Alvin. "A big, messy melting pot." 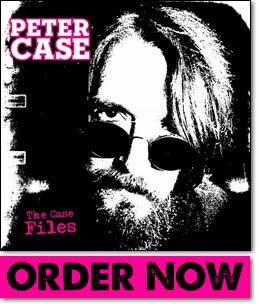 The Case Files collects demos, out-takes, a live shot & other rarities from the 1985-2010 span of Peter Case's solo career. Compiled by Peter himself, this collection combines rockin' full band electric tracks with a selection of dynamic acoustic performances. The Case Files is available now on CD and pink vinyl LP from Alive Records. Fountains of Wayne sign to Yep Roc, plan to release new album in August. Fountains Of Wayne's long-awaited new album, Sky Full Of Holes, will be released in the US on August 2, 2011 via Yep Roc Records. This is the acclaimed band's first new release since 2007's Traffic And Weather. Recorded in New York City, Sky Full Of Holes features 13 new songs by Chris Collingwood and Adam Schlesinger, ranging from high-energy power pop to intimate, acoustic-driven ballads. Songs like "The Summer Place," "Action Hero" and "Richie And Ruben" showcase the band's renowned storytelling abilities and flair for creating memorable characters; elsewhere, they take a more impressionistic approach, as in the shimmering "Someone's Gonna Break Your Heart," the lilting "Firelight Waltz" and the elegaic closer "Cemetery Guns." In signature FOW fashion, the album manages to be simultaneously witty and wistful, imaginative and personal. The band will tour extensively in support of the new album, beginning with a string of US dates in August and September. 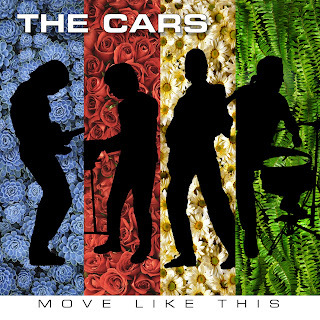 Upcoming releases: The Cars' "Move Like This"
From the upbeat, instantly-infectious "Blue Tip" and "It's Only" to the emotive ballad "Soon" and evocative "Too Late," The Cars forthcoming release Move Like This is a true return to form for the New Wave-era pioneers. "Keep on Knocking" has a driving, guitar-anchored feel showcasing Elliot Easton's outstanding fret work, and across the disc singer Ric Ocasek sings the material with power and style. Original keyboardist Greg Hawkes and drummer David Robinson round out the music making (original bassist-singer Benjamin Orr passed away 2000) quartet. The arrangements are tight and celebrate the unique sound the Boston outfit introduced to the world in the late 1970s. The wait is over!!! Just a little under a week away from its release date, Move Like This, The Cars' first record in 24 years, is available for your listening pleasure! Yes, we know, we're just as excited as you are. General feedback to the new music so far has been overwhelming. What are people saying, you ask? We'll let the music speak for itself....Move Like This can be streamed in its entirety on The Cars' SoundCloud Page as well as RollingStone.com. Nick 13 will release his long-awaited solo album June 7, 2011 on Sugar Hill Records. Nick’s self-titled debut was produced in Los Angeles and Nashville by Greg Leisz and James Intveld, with mixing duties handled by Grammy award winner Jim Scott (Wilco, Tom Petty, Dixie Chicks). Nick 13 crafts storytelling Americana songs of heartbreak, experience and passion, driven by his haunting and distinctive voice and acoustic guitar. 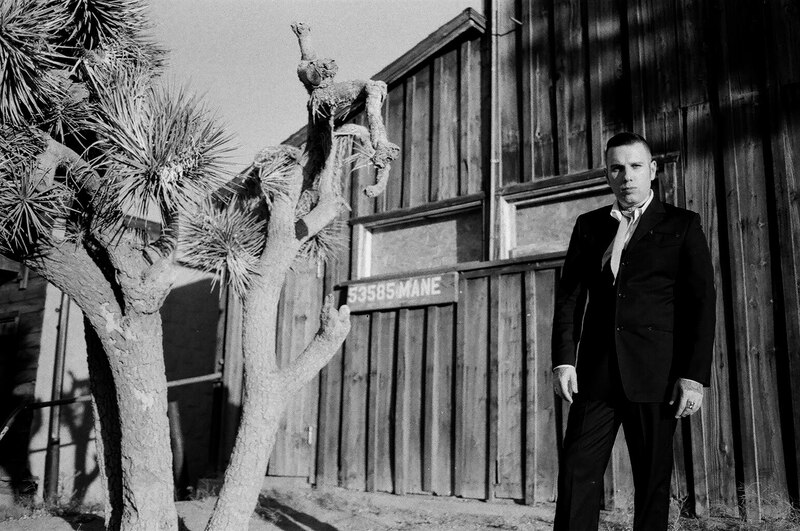 Nick 13 is best known as the singer, songwriter, guitarist and founder of the band Tiger Army. His solo work recalls the vintage American sounds of honky-tonk and classic California country from the middle of the last century with a modern twist. He’s already performed at Stagecoach, Hootenanny and South By Southwest. Nick’s debut album for Sugar Hill Records features acoustic and electric guitar, standup bass, pedal steel, fiddle and much more from a wide pedigree of players who connected with 13’s genuine passion, understanding and knowledge of the history of the music and forward-thinking vision for the future. Some of the folks on the album include Lloyd Green, Sara Watkins, Josh Grange, Eddie Perez and Mitch Marine, in addition to the album’s producers Leisz and Intveld. 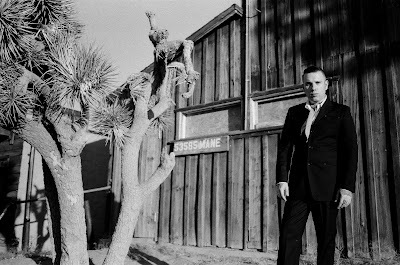 Nick offered fans a brief preview of his solo work during encores at Tiger Army’s 2009 “Octoberflame II” event, followed by a full unveiling on the Palomino Stage at Stagecoach last year. “Nick 13 paid earnest homage to Merle Haggard and Ray Price, both of whom [followed] him shortly on the same stage,” wrote the Los Angeles Times. West Coast shows (including a stop at the roots-music mecca Pappy & Harriet’s in Pioneertown, California) preceded a second major festival appearance at the 15th-annual “Hootenanny.” Playing second to last, just before Chuck Berry, Nick delivered an hour long performance the Orange County Register called nothing less than “an artistic triumph.” Earlier this year he made his first ever appearance at South By Southwest. Nick spent much of the past two years writing and recording his debut solo album in Los Angeles and Nashville (even living above Printer’s Alley for a time) – laying down tracks like “Nashville Winter” featuring pedal steel legend Lloyd Green, the Bakersfield sound “101” and the atmospheric “Carry My Body Down”. Nick 13 will kick off the album’s release with two back-to-back headlining shows in Los Angeles followed by a national tour in June. 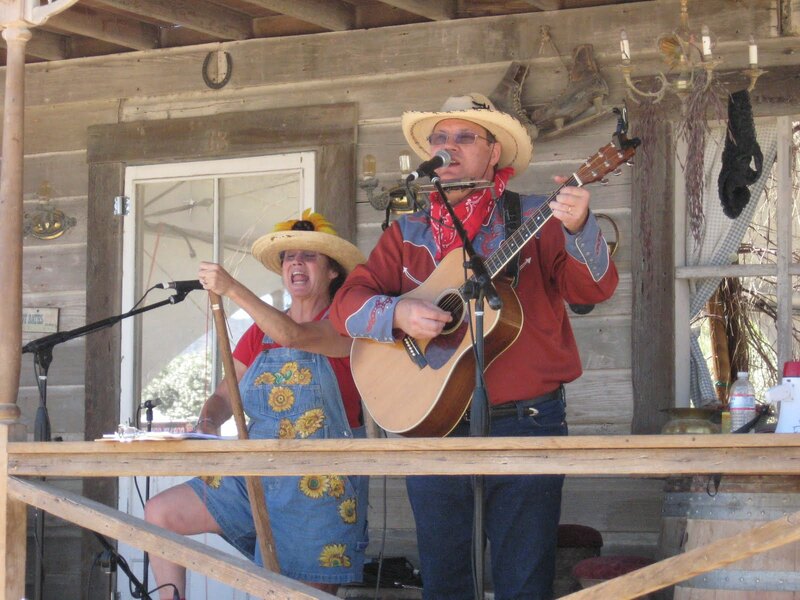 Cornbread Washtub Band members Debbie Lynn McBriety (left) and J.D. McBriety performed on the Front Porch stage on May 1. Americana music took center-stage in the first moments of Stagecoach on Sunday (May 1, 2011), in large part via a trio of retro-looking performances on the Front Porch stage and inside the cool Mustang tent. Since I arrived as the gates opened at noon, I was able to catch a good part of the Cornbread Washtub Band‘s set on the intimate Front Porch. The four-member Calico, Calif.-based group showcased off its musical chops with a newly-penned instrumental, the apt “Welcome to Stagecoach,” before showcasing other witty bluegrass material like “Chucky, the Calico Chukar” and “Whoa Mule! Whoa!,” enhanced by fiddle, banjo and actual washtub bass. Picking up where the CWB left off was L.A. act Triple Chicken Foot, a fantastic trio that impressed equally with superb vocal harmonies and virtuoso musicianship. The old-time string band’s fast-paced set allowed Ben Guzman (fiddle, mandolin), Mike Heinle (banjo) and Kelly Marie Martin (guitar) to solo across a wide range of Americana and roots music. When you boil it all down, there are really two major reasons fans trek out to Stagecoach: some come to hear the music, the rest simply show up for the party. Undoubtedly a handful of fans went for both reasons, but they seem to be in the minority. How else to explain why tens of thousands of fans packed in front of the Mane Stage on Sunday for high-energy performances from modern-day hit-makers like Carrie Underwood and Rascal Flatts but couldn’t be bothered to take the short hike over to catch Wanda Jackson or any other legends performing on the Palomino Stage? And how else to explain that while Jackson was performing, fans were listening attentively and clearly in tune with her set, while even the day’s biggest draws needed to frequently encourage people to clap or sing along, injecting remarks like “good to see all you drunk people” and “everybody with me?” for fear of being swallowed up by the expansive polo field. That diatribe aside, how did 73-year-old Wanda Lavonne Jackson stack up against headliners like Underwood and Rascal Flatts? Just fine, thank you. Since being inducted into the Rock and Roll Hall of Fame in 2009, the Oklahoma native and Queen of Rockabilly has enjoyed a well-deserved resurgence. Her Jack White-produced album The Party Ain’t Over from earlier this year has further fueled interest in her career, and throughout an hour-long performance on Sunday, it was clear that appreciation for Jackson has been overdue. Though noting at the outset that a series of shows last week had left her voice a bit tired, Jackson sounded great throughout most of her set. Whether singing spirited rockabilly hits from the ’50s (“Mean, Mean Man,” “Fujiyama Mama”) or her unique mix of rock and country (“I Gotta Know”) or covers of several Elvis Presley staples (the two toured together and briefly dated in the early days of rock ’n’ roll), Jackson’s performance was a celebration of her life and music. She seemed even more excited when she spoke of her recent work with White, before playing a series of tracks from the new disc. The inclusion of several horn players really bolstered “Shakin’ All Over” and “Nervous Breakdown,” and that energy filled the last half of her performance, which included a rollicking cover of Jerry Lee Lewis‘ “Whole Lotta Shakin’ Goin’ On” during the encore. Josh Turner‘s hour-long set was long enough for the South Carolina native to play his upbeat hits, gospel-flavored religious material and melodic ballads. Known for his uncanny ability to sing both low (think Johnny Cash) and in a pleasing high register, Turner stayed strong thanks to the high-octane country-rocker “Firecracker,” the Cash-styled “Long Black Train,” bluegrass-tinged “Everything Is Fine” and a nice take on George Jones‘ “One Woman Man.” When he played his chart-topping smash “Why Don’t We Just Dance,” it prompted several concert-goers around me to do just that. Carrie Underwood‘s appeal, on the other hand, is obvious: she has incredible vocal range, for starters, and thunderous modern country-rockers like “Cowboy Casanova” were the perfect party tonic as the sky went dark and the atmosphere cooled. Yet, while the young singer’s blend was an instant hit with Stagecoachers, her most excited response from the crowd came when she covered Aerosmith‘s “Walk This Way” and Guns N’ Roses‘ “Paradise City,” the latter of which she’s included live since before her last Indio appearance in 2008, the only time this festival has been a three-day bash. That one-two punch transformed Stagecoach into a hard-rockin’ show. Naturally, she also fared well with her own hits, like “Jesus, Take the Wheel,” “Temporary Home” and “All-American Girl” — all songs showcasing her dynamic voice and growing ability to headline big gigs like this since winning top honors on American Idol in 2005. Finally, to close out the festival, Ohio trio Rascal Flatts unpacked its large crate of hits, delivering a show most memorable for the announcement by singer Gary LeVox that Osama bin Laden had been killed. Chants of “U.S.A.” had broken out several times before and after that announcement in many areas of the sprawling crowd. Day 1 at Stagecoach welcomed the old and the new, the good and the bad across a long unseasonably cool day in Indio. While many of the country music festival performances on the Mane Stage played out against the gigantic party that is undoubtedly the biggest attraction for the beer-drinking masses, gratefully there was solid music-making throughout the day. Kicking off the action in the Palomino tent earlier today, David Serby & the Dirt Poor Folklore were not out to blow away the audience with a sonic roar. Rather the four-man outfit was quick to impress an early-arriving crowd with a fine blend of acoustic country rooted in traditional folk, C&W and Appalachia sounds. While Serby’s previous releases have been steeped in ’60s California honky-tonk, his wonderful Stagecoach set focused strictly on his forthcoming album Poor Man’s Poem, a thoughtful collection of songs set in the 19th century. During the performance, Serby noted that while his songs are set in the 1800s, the issues addressed are in tune with our times. “Sugar Creek,” for instance — a song evoking Harvest-era Neil Young that he wrote about the suicide of soldiers returning from the Civil War — was influenced by present-day stories from American troops. Other numbers addressed a wide range of topics with lyrical depth, from pieces about Native Americans to narratives about self-preservation (the protagonist of one breaks the law because “I just stole back what was mine”). Banjo, mandolin and accordion — provided by the songwriter’s band: guitarist Edward Tree, multi-instrumentalist Matt Cartsonis and bassist Mark Goldberg — all helped bring extra shades to arrangements built on Serby’s acoustic guitar and rich vocals. That artistic momentum continued a bit later when New York quintet Phosphorescent – a band I sadly missed when it performed at Coachella a few weeks earlier — delivered one of the strongest sets of the day. Though the group is now based in Brooklyn, singer Matthew Houck took the stage noting that he wanted to dedicate the first song to his home state of Alabama, hard hit by massive tornadoes that decimated areas. The driving “It’s Hard to Be Humble When You’re from Alabama” sounded as if it could have been penned by Chuck Berry working with a member of the Georgia Satellites. But as Phosphorescent moved through its 45-minute outing, it was clear why the band is so unique. Few outfits blend old-fashioned rock ‘n’ roll, garage-rock, alt-country, blues and folk so powerfully. “The Mermaid Parade” was dreamy and beautiful, with an otherworldly guitar solo, while a mini set of Willie Nelson covers boasted versions of “It’s Not Supposed to Be That Way” and “Reasons to Quit” that tapped into the group’s influences without losing their own far-flung approach to Americana. Through it all, Houck’s real-world vocals never lost their authentic edge. Yet, as great as the first 30 minutes of the band’s performance was, nothing could have prepared for the set-ending “Los Angeles,” a Neil Young-meets-Band of Horses rocker that included a pounding piano and guitar solo duel, plus an explosive, chills-inducing ending. 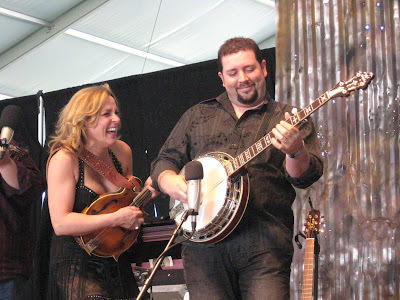 Singer and mandolin player Rhonda Vincent‘s 50-minute showcase in the Mustang tent was just as strong, but here the emphasis was all about breathtaking bluegrass and virtuoso musicianship from both the Missouri favorite (pictured above with banjo player Aaron McDaris) and her fantastic four-man band the Rage (guitarist Ben Helson, banjo player Aaron McDaris, stand-up bassist Mickey Harris and fiddler Hunter Berry). Featuring songs from Vincent’s latest album, Taken, “Ragin’ Live for You Tonight” kicked things off with a trot, allowing breaks for band members to trade solos. Later, “Back on My Mind” featured incredible vocal harmonies from Vincent and her group, while “A Little at a Time” was a slow ballad featuring her stunning soprano. I was not nearly as impressed, however, by Chris Young‘s set in front of a crowd at least a thousand times larger on the Mane Stage. Young, 25, shot to fame after winning Nashville Star in 2006, and he has kept his sights on being a major player in modern country via a string of one-dimensional hits whose titles pretty much sum it all up: the ballad “The Man I Want to Be,” party rocker “Small Town Big Time.” Here, he added what undoubtedly will be future smashes from a forthcoming album, like “Save Water, Drink Beer” and “I Can Take It from There.” But it was only when singing the pretty ballad “Tomorrow” that his approach veered into slightly deeper artistic waters. Mel Tillis, one of country music’s greatest-ever songwriters, crammed a lot of classic material into his hour on the Palomino Stage, backed by a nine-member band whose strength helped the 78-year-old legend deliver a big but nuanced performance. Highlights of his set included “Send Me Down to Tucson,” “Southern Rains,” “Coca-Cola Cowboy” and “Ruby, Don’t Take Your Love to Town,” complete with crowd singalong (much to Tillis’ delight). Although he struggles to hit the notes nowadays, his solid performance marked a strong celebration of his enduring legacy as a master songwriter and traditional hit-maker. Less than 10 minutes after leaving the stage, Tillis came back out, this time to introduce longtime friend Kris Kristofferson, a last-minute replacement for the ailing Loretta Lynn. The two hugged, and then the 74-year-old Kristofferson was suddenly on the stark stage alone. For more than an hour, he huffed and puffed and sung in a sparse, freewheeling approach that delighted the audience crowded in front of the Palomino Stage. Few high-profile performances are as loose as Kristofferson’s, filled with stories, staples, even a few incomplete works.